Like all of us, I desperately wanted Gilad home, but I think that the release of over 1000 unrepentant terrorists eager to kill yet again is not only irresponsible, it’s suicidal, G-d forbid. With that said, today was hands down one of the most magical days of my past 18 years living in Israel. Walking around town, my kids and I would join the crowds–Charedi, National Religious, Secular– that spontaneously gathered in hotel lobbies and shwarma stands and convenience stores in order to catch their first glimpse of the freed Gilad ben Aviva on TV. I cannot remember the last time I felt this kind of unity among Israelis of all kinds. So if this whole story with Gilad’s abduction and release has taught me anything, it is how deeply connected I should feel to every other Jew. Every Jew is a member of my extended family, whether that Jew’s kippah is black, rainbow-colored, or nowhere in sight, like Gilad Shalit’s. And Gilad’s release has also taught me the unfathomable preciousness of a single Jew. Over 1000 Arabs were traded for a single Jew. An entire country is united today in celebrating the release from captivity of a single Jew. That’s how precious a single Jew is. A priceless diamond. A piece of Hashem on Earth. A single Jewish soul. 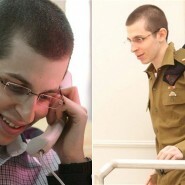 And I felt sad that Gilad Shalit had to suffer as much as he did for me to finally remember that. Here is an Israeli news report about Gilad’s release. Fast forward to the end of the video to see footage of Gilad’s moving meeting his father, Noam Shalit, followed by a photo of Aviva Shalit with her son (who prepared him a big bowl of bamba in honor of his return.) My favorite part of the video is when the Egyptian interviewer asks Gilad whether, after 5 years in prison whether he will fight for the release of the 4000 Palestinian security prisoners in Israel. Gilad, after 5 years spent almost all in the dark in solitary confinement, with the director of Hamas’ military wing right behind him listening to every word, explained right away that he would be happy to see these prisoners released AS SOON AS they stop making terror attacks and wars on Israel. 5 years in captivity and he’s still a proud Israeli and not afraid to speak up for what he believes. So good to have you home, Gilad! This makes me think of a story about the Lubavitcher Rebbi: Each morning he would say Shalom to a man as he walked to shul. The man so wanted to greet the Rebbi before the Rebbi greeted him. But no matter where the man attempted to say Shalom to the Rebbi- the Rebbi always said Shalom first. The Rebbi was just always so aware of other Jewish souls that he always was able to say Shalom first- and with the greeting of Shalom he was acknowledging the presence of other Jew’s neshama. With all of the external differences amongst Jews – all of our souls were at Har Sinai. Since we live in a physical world, we cannot help but be distracted and sidetracked by other’s appearance, but we must try and remember that the body is just a vessle for the soul. However we may practice or observe our traditions- to Hashem everything is One. May Gilad have a complete healing of mind, body and neshama! Setting aside the uneven trade. One Jewish boy, one precious neshama is home where he belongs. Kol HaOlam Nivrah Bishvil Gilad today! Chana, yes, I completely agree with your beautiful article. My 7 year old son was asking me why I was so excited and happy that Gilad was coming home, saying to me, “Ema, he’s not your son, why are you so happy?” And I told him that above all, Ahavat Yisrael is the most important, that we must love our fellow Jew like ourselves and so it is as if Gilad is my son, his brother, our family. Gila, what you wrote about the Rebbe was so true and beautiful as well. “To Hashem everything is One.” Thank you for sharing that. The gum-chewing secular soldiers are those who risk their lives every day in order for you and your family to live in Israel. A Jew is a Jew regardless of his or her level of observance. The neshamah remains pure. We too (“religious”) are not perfect. We are all on a journey towards becoming better. Who is to say who is on a higher level, the so-called “secular” who are kind, who do not speak lashon hara, who give their lives for others, or the “religious” who have many awful faults (as we religious know, this is very possible!). I watched the whole Gilad Shalit video this morning (unusual for me), and I noticed at the very end, what was the crowd singing? “Anachnu maaminim bnei maaminim, we are believers the children of believers, and we do not have upon whom to depend, except for G-d” These are your so-called secular people. They might be on a higher level than some so-called religious.